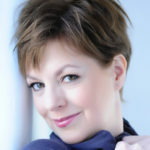 Mezzo-Soprano Jennifer Westwood graduated from Birmingham University with ﬁrst class honours and went on to train at the Britten-Pears School and the Royal Northern College of Music. For sixteen years Jennifer was a member of the celebrated Bayreuther Festspielchor, from which she sang small ensemble and solo roles (Edelknabe, Lehrbube, Edeldame) both at the Bayreuth Festspielhaus and on tour in Barcelona, Lucerne and Toulouse. In the UK, she has sung the roles of Erda, Schwertleite, Grimgerde and Roßweiße, 1st Norn and Flosshilde (Der Ring des Nibelungen) and Flowermaiden and Voice from Above (Parsifal). As a chorister, she has sung in all of Wagner’s chorus operas at Covent Garden, the most recent being David Alden’s new staging of Lohengrin in 2018. A busy concert singer with a wide repertoire, Jennifer is particularly drawn to music from the 18th and 19th centuries both in oratorio performances and solo recitals. She has sung the Angel in The Dream of Gerontius in Hong Kong for the HK Bach Choir, has toured Finland (Rossini’s Petite Messe Solennelle, Vivaldi’s Gloria) and has appeared with the Lindsays and Ensemble 360 in Music in the Round Festivals at Shefﬁeld’s Crucible. Jennifer took part in Richard Jones’s celebrated production of Die Meistersinger von Nürnberg at English National Opera. She sings with the chorus of The Royal Opera, Covent Garden each season, has appeared with them at The Royal Albert Hall for the BBC Proms – Götterdämmerung under Barenboim and Parsifal under Elder in 2013 – at Symphony Hall, Birmingham and on their 2015 tour to Japan. She was the alto soloist in The Royal Opera House’s 2015 lunchtime Christmas concert in the Paul Hamlyn Hall (Poulenc and Saint-Saëns).